Although members of the Native American Church usually take peyote for the purpose of religious enlightenment, some may also use the substance as artistic inspiration. The two do not have to be mutually exclusive. In fact, the artwork inspired by peyote is intended to elicit a spiritual effect in viewers. As such, peyote artists do not want their work bought and sold, although it may be given as a gift. The artwork is rarely displayed in the homes of Peyote families. Instead, it is used during religious ceremonies and then stored away for later. 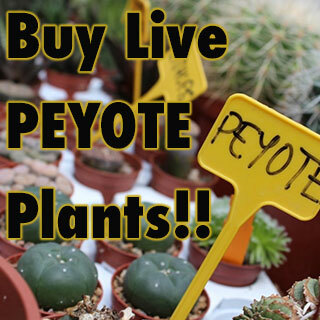 Peyote art covers a huge range of genres and mediums, including beadwork, basketry, painting, drawing, stonework, wood carvings, metalwork and featherwork. The artwork inspired by peyote may be elaborate and full of color or simplistic in nature. It can bring about a somber feeling or fill the viewer with joy. ISymbolism is especially important in peyote art. There are several symbols seen over and over again in the works of peyote artists. They are: eagle, corn, turtle, snake, jaguar, shaman, deer, sun, scorpion, prayer arrows, and of course, peyote buttons. Given the private and religious nature of the genre, there is little Peyote work on display in art museums. However, there remain a few very well known examples of Peyote art. Woody Crumble is famous for painting a beautiful peyote mural on the wall at the Department of the Interior. A 1941 exhibit at the New York Museum of Modern Art included a peyote painting called “Bird in Flight,” which was created by Monroe Tsatoke. A 1969 collection of Indian artwork at the Southern Plains Indian Museum in Oklahoma included a total of eighteen works made by peyote artists. More recently, Clarence Rockboy has been recognized on a national scale for his valuable contributions to peyote artwork. Even when peyote art is not recognized in museum exhibits, it remains an important part of the peyote experience. The artwork may not have a monetary value, but its spiritual value is infinite. 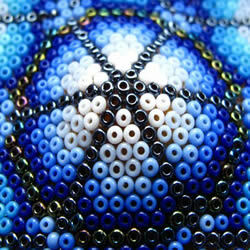 One very common genre of peyote art is beadwork. In addition to being used in peyote art, the popular peyote stitch is used by beadworkers all over the world. Also known as the gourd stitch, this technique is used in off-loom bead weaving. It is a favorite with bead artists because of its versatility. With the peyote stitch, artists can use either an odd number or an even number of beads in every row. The stitch also allows artists to weave beads into tubes, flat strips or flat circles. This versatility allows artists to stitch beads onto a variety of jewelry and clothing items. The peyote stitch is also commonly used to decorate gourd containers, which is why so many artists refer to it as the gourd stitch. Although the peyote stitch is named after Native American beadwork, it has been used in dozens of cultures around the world. The stitch dates back to ancient times and has been recognized on unearthed artifacts from ancient Egypt. Researchers believe that the peyote stitch was discovered individually in Africa and America. The Africans spread it across Asia and Europe, and the Native Americans of present-day Mexico carried it throughout North and South America. The stitch may not be unique to the peyote religion, but it has garnered a lot of attention for the practice of peyote beading. "Peyote Stitch Beading Class Part One - Flat Even Count Peyote Stitch Beading. "About.com: Beadwork.